Lupita Nyong'o has won an Academy Award and a Screen Actors Guild Award for her role in "12 Years a Slave," and now, according to People, she can add that award for Most Beautiful to her list of achievements. "The Today Show" revealed that the stunning 31-year-old actress will grace the cover of the magazine's annual "50 Most Beautiful" issue, marking the publication's 25th anniversary of the list. "It was exciting and just a major, major compliment," she told the magazine. "And especially, I was happy for all the girls who would see me on [it] and feel a little more seen." The cover went to Gwyneth Paltrow last year, and as she told the "Today" show in a pre-taped interview, the honor was something she never expected. "What an incredible journey to go from that feeling to being on the cover of this magazine. I mean, you could have never told me that that would happen when I was 16 and insecure about my complexion," she said. "I hope it means something to more than just me, to people like me who feel unbeautiful in whatever skin they're in." Nyong'o was born in Mexico and raised in Kenya and told People that she first associated beauty with what she saw on television, which was "light skin and long, flowing straight hair." 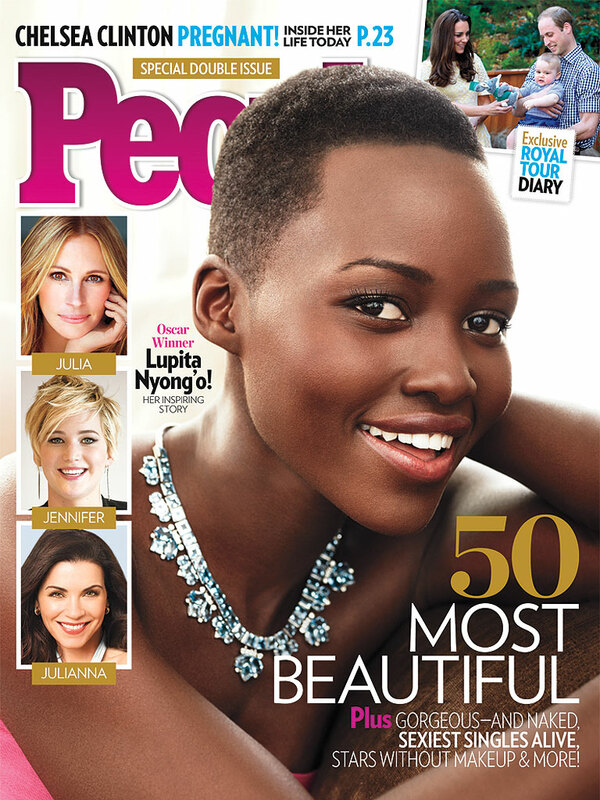 Yet, it was her mother Dorothy that made Lupita realize her beauty saying that "I finally I believed her at some point." And while Nyong'o, who has yet to book another movie role, has now accepted and appreciated her own beauty, that doesn't mean she's always completely at ease, especially when she steps on to a red carpet. "The red carpet — I mean, that thing is intense!" Nyong'o admitted. "It's horrific, it's frustrating, it's painful, it's beautiful, it's funny, it's exciting and it's fun." Other notable stars featured in the magazines issue, which hits newsstands Friday, are Jennifer Lawrence, Pink, Kerry Washington and Amber Heard.